A patent ductus arteriosus which is a congenital heart defect where the ductus arteriosus fails to close after both. The ductus arteriosus is a vessel that connects the pulmonary artery to the proximal descending aorta (pictured below, source). The ductus arteriosus is present before birth in order to shunt blood away from the developing lungs in the fetus. The pressure is greater in the right side of the fetal heart so blood moves from the pulmonary artery directly into the aorta. 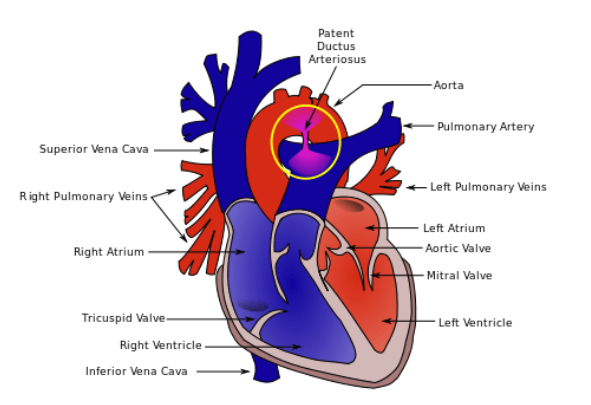 After birth, the balance of pressures is reversed, and increased blood pressure in the left side of the heart causes blood to move from the aorta into the pulmonary arteries. This ultimately delivers more blood the pulmonary vasculature and can lead to complications such as pulmonary hypertension.